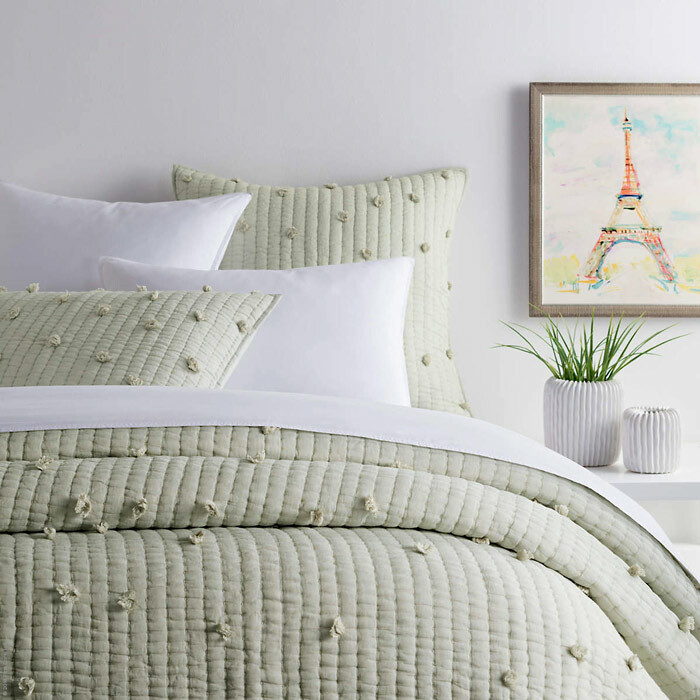 In white, Pom Poms Quilted Coverlet is simply playful. Depth and iridescence evolve when sky and cream colors are woven together in a technique creating the moonstone color. Kantha quilted gauze coverlet and matching shams have incredible fluidity and drape and are irregularly tufted with little scattered pom poms in self-color for playful whimsy. Crafted by artisans committed to fair-labor practices. In white, Pom Poms Quilted Coverlet is simply playful. Depth and iridescence evolve when sky and cream colors are woven together in a technique creating the moonstone color. Kantha quilted gauze coverlet and matching shams have incredible fluidity and drape and are irregularly tufted with little scattered pom poms in self-color for playful whimsy. Crafted by artisans committed to fair-labor practices. 100% cotton 2 colors Knife edge 1-inch hem all sides Vertical kantha stitching Fringe embroidery Machine wash cold. Tumble dry low. Do not bleach. Do not iron.